The AK family of rifles, among them the AKM and AK-74, are among the world’s most prolific and effective, popular with military, police and civilian shooters everywhere. In the U.S., the Kalashnikov has not always been popular, but since around 2010 has been enjoying a sharp increase in popularity thanks to the efforts of high quality commercial manufactures and dedicated enthusiasts. But is it true? If one wanted to arm themselves with an AK variant for defense, hunting or competition, will they be hobbling their capability past a hundred yards or so? Just how far can you push an AK with any standard of accuracy? Does make, model and cartridge make any difference, or is the path of the Kalashnikov one of little precision? While it is true that the progenitor of the AK family, the venerable AK-47 was never expected to deliver what we today would call good or even acceptable accuracy, the modern iterations of this rifle are a far cry from that inception. In this article I will address common assumptions, questions and a few myths about this legendary rifle. The history of the AK-47 and its successor rifles, including conceptualization, design and adoption has been covered extensively elsewhere, and will be pared down to only its most pertinent elements for this article. First introduced in 1947, the AK-47 was designed by Mikhail Kalashnikov, a Soviet tank commander, while recuperating in a hospital from wounds sustained in battle. After hearing the woes of Soviet infantrymen facing what they perceived to be superior German weaponry, and the Red Army leadership’s desire to reach parity, he set about designing a rifle that would help arm his comrades with an efficient, effective assault rifle. His original design and its first revisions revolved around traditional Soviet doctrine of the day concerning small arms: cheap, simple and quick to manufacture, highly rugged and reliable, and easy to use, accurate enough. Note accuracy was not a design priority for this new infantry rifle, as the engagement doctrine of Red Army infantry emphasized short or long bursts of automatic fire, depending on the situation. The specific design characteristics of the AK family including generous design tolerances, the riveted and stamped receiver, and a long stroke gas piston system are not conducive to great mechanical accuracy. This is further exacerbated by military ammunition, either 7.62x39mm or the modern 5.45x39mm, being made with loose quality control practices by western standards. While not strictly a mechanical factor, the simple notch and post sights on the AK do not lend themselves to great precision for most shooters. All of these factors add up to a rifle and ammunition combination that typically produces groups of around 4-5” at 100 yards, or 4 to 5 MOA. Therefore one would expect, barring shooter error or other external inconsistencies to net groups of 8-10” at 200 yards and 12-15” at 300 yards, long held to be the outer edge of an AK’s effective range on a point target with military ammunition. Remember this is ideal mechanical accuracy; start factoring external and shooter-error variables as you can see why many will struggle to keep rounds on a full size silhouette even at 250 yards! While acceptable for what it is, many U.S. shooters will expect better accuracy from any rifle. The AK’s cousin, the humble SKS can be expected to net at least 4 MOA at 100 yards. Is there anything to be done to improve upon this dismal accuracy? Where should we look first to start reducing the variables acting against us? You will popularly see the AR-15 pop up in the discussion when discussing accuracy potential of AK’s. Of course, these two dueling designs are compared against each other down to the minutest of elements and so accuracy is naturally among them. While the AR-15 enjoys a reputation for very good accuracy, or at least superior accuracy to the AK family, I do not think it is entirely germane to enter it into the discussion of potential accuracy of AK rifles. The AR is not chambered in either of AK’s typical cartridges (with only a few oddball exceptions) and is designed to utilize brass cased ammunition. The AK is designed to utilize steel cased ammunition. While accuracy comparisons are fair when both are shot against each other with nominally equivalent guns and ammunition, (i.e. quality commercial or mil-surplus ammo in both, guns from quality commercial manufacturers, etc.) the average “test” will see people using such baffling protocols as steel cased ammo in both guns to make sure the test is “fair,” or the reverse; brass cased ammo in both. I have seen a 5.45mm or 7.62mm upper on the AR in order to keep the cartridge the same in both guns, when the only real merit to such an upper on an AR would be for perhaps testing potential accuracy of a given cartridge. A proper multivariable analysis of both guns in a head to head competition would be trying for even a lab setup for such tests, to say nothing of an average user or amateur tester. While simpler anecdotal tests may produce useful data, they are not exhaustive laboratory testing, and so all results must be taken with a grain of salt. The Rifle, The Ammo, or Both? Most of the time, this middling accuracy produced by the AK is the result of both the design limitations of the gun, and poor quality ammunition. The traditional wooden AK handguards will swell, shrink and warp with heat and moisture, with the corresponding changes in pressure around the trunnion and handguard cap affecting the barrel. Stamped AK’s are noted for considerable amounts of receiver flex and barrel whip during firing, both effects that add up to unfavorable barrel harmonics. All this being said any but the cheapest of the cheap commercial guns available in the U.S. should be expected to produce better accuracy than most off-the-rack military AK’s. The ammunition is another story: Just how much accuracy is either the 7.62mm or 5.45mm inherently capable of? There are few guns beside the AK’s that chamber either one, and good quality commercial loadings are likewise scarce for both, to say nothing of true match-grade loads. 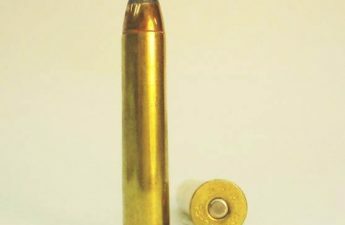 This leaves us most with a serious question mark about the capability of the ammo itself, as reducing variables is key to determining where the “bottleneck” is on obtaining best accuracy. The best, most accurate ammo will still only shoot as good as the rifle can, and inversely the best rifle will only shoot to its best potential with correspondingly accurate ammunition. Both will only shoot as well as the shooter can. A perfectly accurate laser will only produce 3 MOA groups in the hands of a 3 MOA shooter. It is this confluence of variables that make wringing out AK’s for accuracy so challenging: determining the base mechanical accuracy of the rifle is tough when you don’t have quality ammo. If you do have quality ammo, a shooter will struggle somewhat with the typically rough trigger and mediocre sights of the AK. Lacking a solid benchrest setup and magnified optic will also hurt the results. Nevertheless, the easiest component to control for in an accuracy test is the ammunition. Modern commercial loads, even cheap, steel cased fodder will routinely produce groups in the 3 to 4 MOA range from a commercial AK. Not a bad improvement for just changing the ammo. Some affordable steel cased loads, in particular ones from Golden Tiger are surprisingly accurate, and have been reported to produce sub-2” groups from a good AK. Other manufacturers, like Hornady and Red Army Standard turn out similarly accurate ammunition with a variety of projectiles. Bottom Line: a decent rifle coupled with good ammunition can easily get an AK grouping in the 3” range at 100 yards. A rifle that will consistently produce 3” groups at 100 yards is more than accurate enough for a defensive or general purpose rifle. 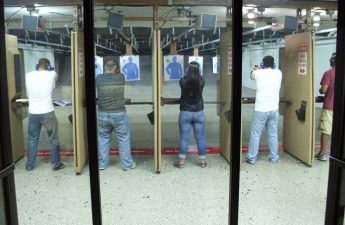 At 200 yards, a good shooter will typically hit what they are aiming at unless it is a very small or partial target. On the outside, at 300 yards, that is a roughly 9” group. That may sound huge in this era of scarily accurate hot rod carbines, but before you condemn it, grab a measuring tape and lay it across your torso. I would not take my chances in the open against such a rifle. More accuracy is always better, but most stock commercial AK’s are good enough for closer work. Mind you, this is before you enhance the gun with better sights, an optic or cleaner trigger. What might we achieve with a top-tier rifle? An AK from a high quality manufacturer, especially one in 5.45mm, will be capable of producing very good accuracy with quality ammunition. I have personally fired several examples of guns from Arsenal Inc., their SLR-107’s, which printed 2 ¼” groups with boring regularity at 100 yards using an RDS. This level of accuracy is practically achievable if one is a good shooter, and some guns are capable of even better accuracy. Selecting a quality commercial AK will go a long way to alleviating you of your prejudices against the accuracy potential of the platform. 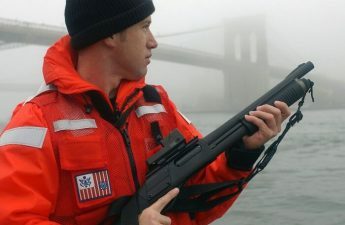 Even on a lesser gun, improvements to stock controls and sights may help the shooter to extract more accuracy from his rifle, and can be had on any AK if one spends the money and effort to enhance it. The simplest improvements will be replacing the trigger with a better one, and installing a solid optics mount, be it on the traditional side rail or a handguard system. Avoid entirely the cheap, flimsy replacement top covers that have a rail section crudely attached to it. Most will not hold a zero. Use caution before selecting any component that either by intent or coincidence clamps around the barrel: some actually claim to improve accuracy by reducing whip or stiffening the barrel, and while some users report gains in the accuracy department, many of more complain of reduced accuracy. Whatever you decide, be sure you have a good recorded baseline test of what your gun will do without the mount installed, and then test it again afterward. The stock iron sights can be improved by replacing them entirely with a set that features a thinner front post, or wider rear notch, occasionally both. There are also devices that replace the rear sight with a mount for a miniature red dot. A trip to a gunsmith or customizer specializing in AK family rifles can ensure that a host of small things that add up to accuracy are correct on your rifle: the muzzle brake can be tightened, or permanently affixed to reduce wobble; the crown of the barrel can be checked for concentricity and uniformity; the gas piston can be checked for correct fitment. Don’t forget to have them install a trigger while it is there. The AK family of rifles may not ultimately be able to match the most cutting-edge and accurate designs of today in the accuracy department, but a well-made AK stoked with quality ammo is certainly no pushover, and will allow a competent marksman to hit his targets beyond 300 yards with aplomb. The AK continues to advance into the 21st century, and together with modern ammo, will allow it to remain viable for the foreseeable future.